"There's always something we could do after work. But we know that on Mondays and Wednesdays, we will be at Pursuit Fitness." 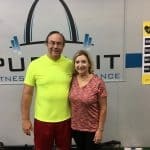 PFP, and they support each other in their fitness goals and journey. ago, and the pair have been dedicated members ever since. meals has been worth it since both of them are participating. B: Core exercises that help my golf swing. an engineer at Boeing with the F-15 Japan program. Looking forward to…skiing in Colorado in January. and hurting her ankle, Barb fell down like she was doing a burpee and popped right back up!